Winter recipes are the perfect season for kale, apples, and pomegranate which match perfectly with each other and give us a crispy yet fulfilling taste when having a fresh bite. With this easy-to-make, yet nutritious recipe, you can enjoy a cozy winter. With a raw food menu item like this, your electrical appliances in your kitchen can have a rest, while your body is also having a rest with such a healthy-cleansing meal. 1. Chop the almonds coarsely. 2. Wash and dry the kale. Remove the stems and use a food processor or mini chopper to chop the kale into a very fine texture. You can use a sharp knife. Place kale into a large salad bowl. 3. Prepare the pomegranate – cut into four equal parts. 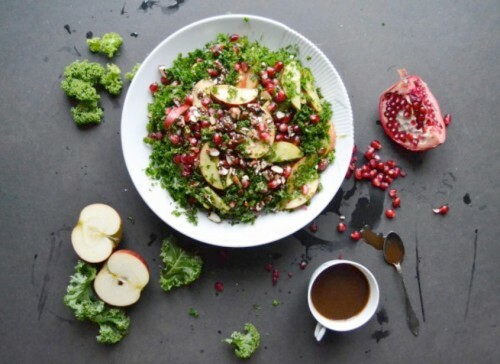 Use a spoon to scoop out the pomegranate seeds into the bowl of kale. Cut the apple into thin canoe-like shapes and mix all with the kale. 4. Make the dressing by stirring everything thoroughly together and season to taste. 5. Stir everything together and serve.